Residents say saving the chickens is a way of preserving a sense of home, a connection to nature and a cheap, healthy food source. Cathy Haas cleans the chicken coop at Cathedral Gardens, a low-income apartment complex in St. Johns. Out-of-state property owners have warned the chickens must go. Photo by Joe Riedl. The effects of a red-hot housing market are writ large on the Portland skyline. More than 5,300 new units of housing were approved last year, yet that didn’t stop market-rate rents from rising 13 percent, further pushing low-income families to the margins of the city and reducing the housing options for those who remained. But sometimes the most upsetting changes can be small. Like a 50-by-20-foot chicken coop. The Seattle-based owner of a North Portland low-income apartment complex is threatening to remove an 18-bird coop from a backyard area behind one of its many large buildings. 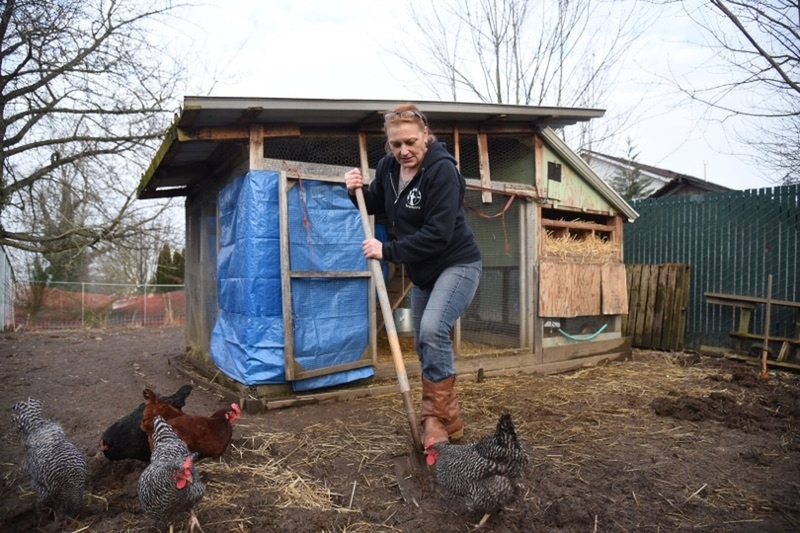 It’s the only chicken coop at a low-income apartment complex in Portland. Residents at the St. Johns complex, Cathedral Gardens, say the coop provides valuable education for neighborhood children who otherwise get little contact with animals. It’s also the only coop on city-owned property—the building was publicly owned until sold to private landlords in 2013, and the chickens sit on Portland Parks & Recreation land. The coop’s manager, Brad Melaugh, of youth community garden nonprofit Village Gardens,­ says the buildings’ owners have told him the chickens have to be out by the end of February. The owner, affordable housing developer Vitus Group in Seattle, denies that, and says it hasn’t decided the chickens’ fate. The squabble may seem minor, but raising backyard chickens is an archetypal Portland experience. The planned removal raises questions about what the city’s poorest citizens can expect when public housing is outsourced to private interests. For residents, saving the chickens is a way of preserving a sense of home, a connection to nature and a cheap, healthy food source. One morning last month, the chickens had drawn a trio of Latino children to the coop at Cathedral Gardens. The children plucked grass to feed the hens. “Oh God, don’t peck me, pollito!” cried Gabriel, one of the three elementary school-aged kids who laughed hysterically while dodging the birds’ sharp beaks. “I like eggs,” said his friend Adrian. “I like beaks,” Gabriel added. Built in 1971, the 125-unit apartment complex is tucked alongside Pier Park’s disc golf course and North Columbia Boulevard. The buildings are set aside for the city’s poorest residents: A family of four must make less than $36,650 a year to live here. Cathedral Gardens, once known as St. Johns Woods, has long been public housing. But it’s one of four area apartment complexes to be sold to out-of-state investors since 2012. To read the rest of the story at Willamette Week’s website, click here.